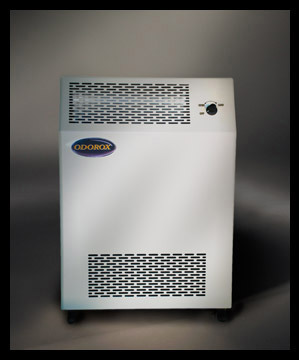 The Odorox® Slimline unit is suitable for medical, clinical, institutional, commercial, or residential use up to 1500 sq.ft. (150 sq.m.) assuming a 9ft/3m ceiling and eliminating bacteria, viruses, moulds and chemical off-gassing typically found in public spaces within buildings. Slightly larger than SanX™ the Slimline™ is still very portable, as well as floor or wall mountable, so is a suitable choice for example in medical offices, long term care facility usage, commercial offices, residential homes or apartments. Slimline™ is equipped with a variable speed fan control and a washable filtration system. The variable speed built in fan is adjustable from approximately 100 to 400 cfm and operates using only 1.4 Amps. Mobility Handle / Stand Brackets. Odorox®, Slimline™ and HGI Industries Inc. are either registered trademarks or trademarks of HGI Industries Inc. of Boynton Beach, Florida USA. Other trademarks are pending in the U.S. and other countries. Please contact 0208 123 5680.